This is my birthday furniture, and it’s my new favorite place to be. When the oak pollen has finished making my life difficult, I’ll sit here with my knitting and a big glass of iced tea. There will be flowers, and maybe a little table. The chair was a gift from my friend Judy, the ottoman was from my sister Ellen, and the pillow was stitched by my sister Sarah. There are also plants from the Remarkable R’s. 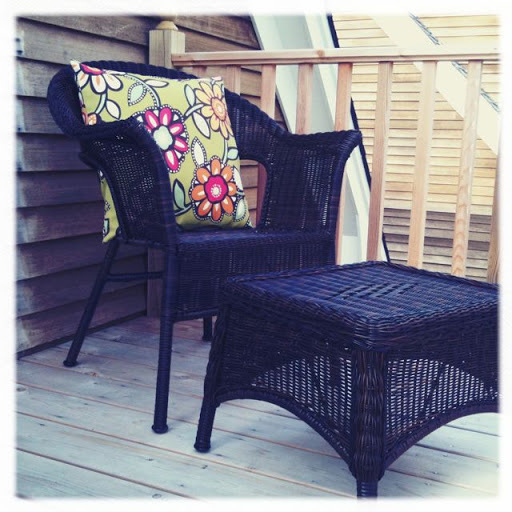 Their brilliant gift coordination helped turn my little deck at the top of the stairs into a wonderful place to relax and enjoy the summer! How very lovely! Happy Birthday!! A fitting double birthday gift! Hoping sea breezes waft by as you sit knitting or reading in your new favorite place. Yay for you!I have to confess, though – chairs with arms leave me knitting-stymied. They absolutely drive me nuts. So I wish you elbows free of obstruction as you knit and knit and knit right here. Oh, what a wonderful spot!! How inviting! What a wonderful spot to while away the summer! Enjoy! Jane, it looks like a marvelous place to sit and enjoy. How about a nice glass of Chardonnay while you read and knit? Right now I am typing on my iPad from our covered front porch at our little B&B in Boquete, Panama. Thunder is rumbling in the background and the tropical rain is pounding down on the tin roof. It is beautiful here and wish you could see it. So we are front porch.deck sitting together!